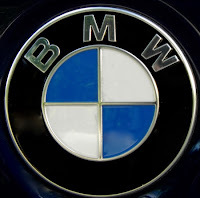 BMW — which is much easier to remember than“Bayerische Motoren Werke” AG, or in English, “Bavarian Motor Works” — has championed the slogan “The Ultimate Driving Machine” since the 1970s, and it doesn’t take a long time behind the wheel of just about any of its models to see that that is no idle boast. Though I haven’t had the opportunity to drive every one of its offerings, I have never been disappointed by the performance of any of those I have. Power and handling is always at the top of its class. But Teutonic technology can be overwhelming. I find BMWs at times to be over-engineered to the point that all the gadgets and gizmos detract from the enjoyment you get from the overall experience. German designers and engineers seem to have a knack for taking the most basic of tasks, like changing a radio station or adjusting the scale on the navigation map, and complicating them to the point of frustration. 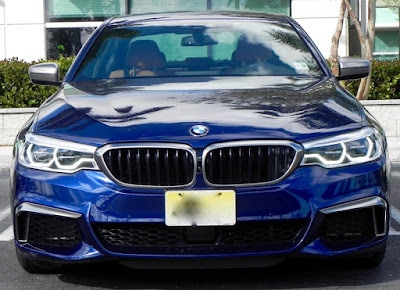 But that was not the case with my week in the 2018 BMW M550i xDrive. Not this time. The M550i xDrive is a new addition to BMW’s 5-Series lineup, the first time the company has offered an M Performance version of what it calls its business sedan. Under the hood is a 4.4-liter, twin-turbo V8 that pumps out 460 horsepower at 5500 rpm and 480 pound-feet of torque at only 1800 rpm, propelling the five-passenger vehicle from zero to 60 mph in under 4.0 seconds. 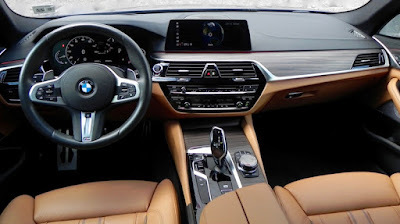 It is mated with an 8-speed Sport automatic transmission with Eco, Comfort, Sport, and Sport+ settings with the xDrive system sending all that power to all four wheels, though the bias toward the rear wheels results in more of a rear-wheel drive feel. As with the 540i (reviewed here: www.bit.ly/2nhpyZc), the M550i comes with a ton of technological features the operation of which BMW is either dumbing down or I’m getting used to it. I still would like a separate knob to surf the radio dial, but then I’m a techno-Neanderthal. 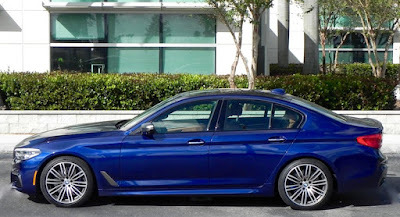 Among items included in the base MSRP of $73,095 (including destination and delivery) are M Sport brakes, 19-inch alloy wheels with run-flat tires, power trunk lid, keyless entry and push-button start, moonroof, automatic climate control, adaptive LED headlights, navigation, aerodynamic kit and rear spoiler, rear-view camera, 20-way power adjustable front seats with 4-way lumbar support, leather and wood interior trim, and BMW’s iDrive 6.0 system with touchscreen, touchpad, and a 10.5-inch display screen. Adding such extras as a Bowers & Wilkins sound system, NightVision with pedestrian detection, a Dynamic Handling Package (adaptive suspension and active roll stabilization), a head-up display, an Executive Package (soft-close automatic doors, ceramic controls, wireless charging, WiFi hotspot, and enhanced USB and Bluetooth), and a Parking Assistance Package ran the total for my test car to $88,985. The cabin ambiance is the final touch. Yes, the M550i is a performance vehicle, but it’s also full-on luxury with a smooth, quiet ride to coddle the most finicky of riders. 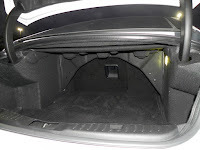 I’ve got to say the interior is pleasing to the eyes as well as well as comfortable for your tush. What I liked about the 2018 BMW M550i xDrive: Sport+ mode provides a treat for the ears as it adjusts the dual exhaust as well as enhanced performance that makes this midsize sedan a joy to drive. 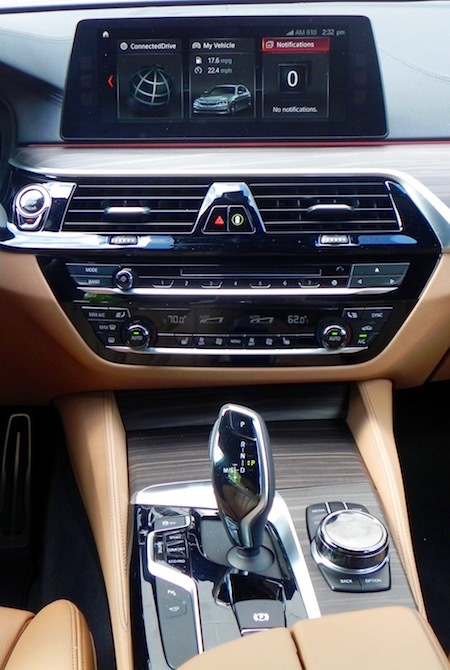 What I didn’t like about the 2018 BMW M550i xDrive: Operating the infotainment system isn’t quite the task it used to be (maybe I’m getting used to it), but making the simplest of adjustments still requires extra steps that can be a distraction when you are driving. Not everything needs to be operated off the screen. 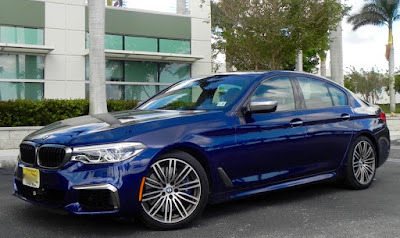 Would I buy the 2018 BMW M550i xDrive? Yes. You can get into the 5-Series for much less than the M550i’s price tag, but you’ll miss out on getting all it has to offer. After going through a mid-cycle refreshing this year, the Lincoln MKZ will remain basically unchanged for the 2018 model year. which means that unless you are fanatical about having the “latest, newest” of everything, you could get into the entry-level luxury market at some savings by going with the 2017 MKZ. 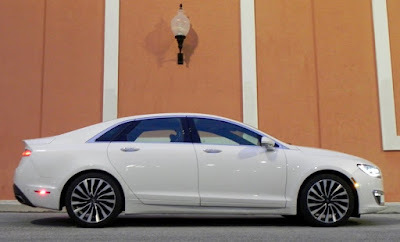 In fact, you could probably go back to the first year of this, the second, generation (2013) and still get to enjoy the laundry list of features that Lincoln has built into this mid-size family sedan while keeping the MSRP in the mid-$35,000 range. Or you can go full-blast with the top-of-the-line Black Label edition of the MKZ and get even more. Black Label is a program Lincoln introduced to dial up the luxury for its top-of-the-line trims, upgrading interiors with higher grade leather and real wood trim and faux suede headliners and offering unique exterior colors and wheels. It was first introduced, appropriately enough for this review, on the 2015 MKZ. 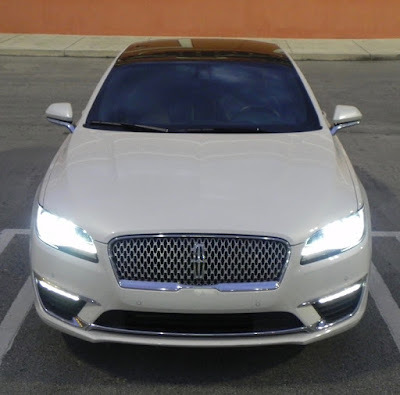 Going with that option does add to the cost, of course, as the 2017 Lincoln MKZ Black Label edition with all-wheel drive that I had for a couple of weeks carried a base price of $50,485 (including destination and delivery) with extras like the 3.0-liter V6 engine, a climate package,and a batch of technological features running the total to $61,765. That’s not quite the bargain of the basic MKZ, but it’s still under what most of its competitors ask for with their top models. Though the optional twin-turbo V6 engine delivers up to 400 horsepower and 400 pound-feet of torque (in all-wheel drive configuration; front-wheel drive models are limited to 350 horsepower) to enhance the driving experience, the MKZ is not so much about performance as it is cruising comfort. Frankly, that’s probably more in line with what many of us expect from the luxury class to begin with. The combination of the V6 and AWD mated with a 6-speed automatic transmission results in somewhat disappointing fuel figures of 17 miles-per-gallon city, 26 highway, and 20 combined. To compensate, it does run on regular 87 octane fuel. So, too, do models with the turbo-4 and the hybrid setup that are rated at 21/31/24 and 40/38, respectively. Many competitors in the segment demand premium fuel. Or at least recommend it. 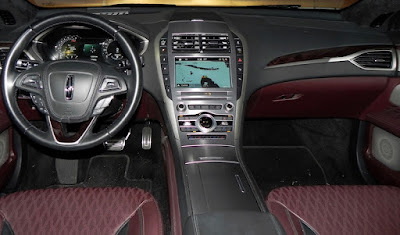 The list of standard equipment for the MKZ includes that Alcantara headliner, dual exhaust with chrome tips, adaptive headlamps with signature lighting, dual zone electronic auto climate control, heated and cooled 10-way adjustable front seats with lumbar support, power tilt and telescoping steering wheel, remote start, rearview camera, leather seats, and a voice-activated navigation system. That's enough to satisfy most of your needs without even going into options. 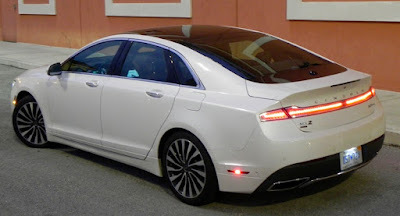 I have seen the MKZ referred to as a “Baby Continental” but would take issue with that on a couple of counts. One, when the MKZ was introduced in 2006 as Lincoln Zephyr, in homage to the Lincoln Zephyr models of the 1930s, the Continental had been out of production for about four years. By the time Lincoln brought the Continental back as a 2017 model, the MKZ was well into its second generation. Also, though the Continental has numerous merits in its favor, calling the MKZ a “baby” anything demeans it unnecessarily. 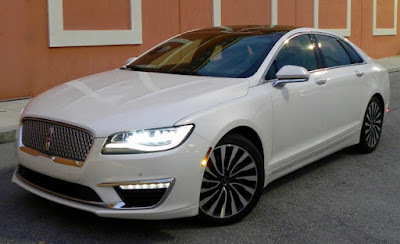 Yes it is slightly smaller than a Continental — at 193.9 inches long the MKZ is 7.5 inches shorter than the Continental and its wheelbase of 11.2 inches is 5.7 inches shorter — but it has a roomy feel about it. Legroom in front is a generous 44.3 inches — about the same as that offered by the Continental — though the back is a more snug 37 inches compared to the 41. 3 in its bigger sibling, which can be a factor if you typically have a couple of adults riding back there. 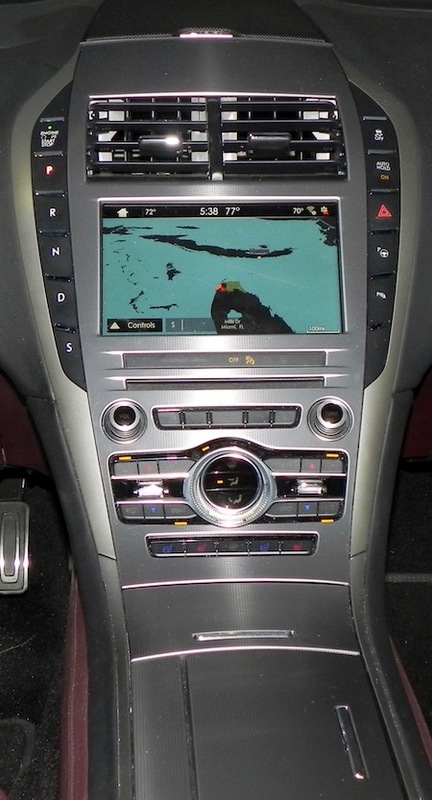 What I liked about the 2017 Lincoln MKZ Black Label: Getting the hang of the Sync 3 system for infotainment functions is a snap, and the 8-inch screen is easy on the eyes. Getting into the driver’s seat was easier than getting into the Continental with its front-seat side bolsters getting in the way. Styling is a matter of preference, but I like the MKZ’s exterior look. What I didn’t like about the 2017 Lincoln MKZ Black Label: A little more in the way of performance might be nice, as well as improved fuel mileage. Guess that’s a conflicting wish there. The trunk is roomy enough in non-hybrid models (15.4 cubic feet) but the configuration to accommodate rear speakers makes arranging storage loads a big tricky. Would I buy the 2017 Lincoln MKZ Black Label? Yes. If you want a traditional, true luxury car without a luxury price tag the MKZ is worth a look. A recent study out of a university in the Netherlands proclaims that there is no such thing as love at first sight. What people often call love at first sight really is just a strong physical attraction, more like lust at first sight. 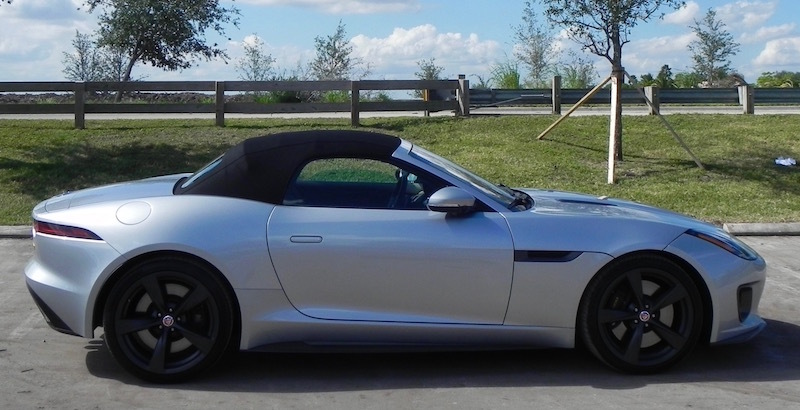 When it comes to the Jaguar F-Type, both emotions fit for me. I know that I feel in love with the performance oriented two-seater when it hit the streets as a 2014 convertible (a coupe would follow), and I have lusted after it ever since. 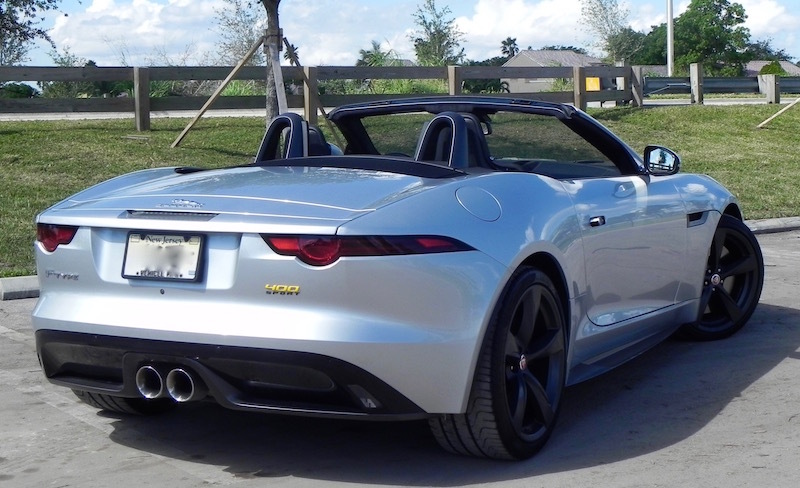 For those of you who may argue that “love at first sight” doesn’t last, I will only say that each year Jaguar tinkers with this roadster simply raises the intensity of my feelings for it. Oh, I realize it’s not a perfect car. It’s technology is a bit cumbersome to operate and is about a half-step behind that of its competitors, but quibbling about that is like demanding that the world’s most beautiful female be able to cook like Betty Crocker. Would Cindy Crawford be Cindy Crawford without her trademark mole? Being Jaguar’s first sports car since the E-Type was discontinued in 1974, the F-Type was not shy on horsepower when it was introduced three years ago or so. The base model’s V6 was rated at 340 horsepower and 332 pound-feet of torque. The V6 in the F-Type S bumped that up to 380/339, respectively, and the F-Type V8 S had numbers of 495/ 460 with a reported zero-to-60 mph clocking of 4.2 seconds. 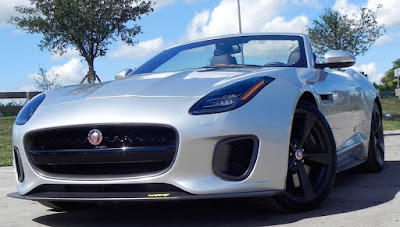 The F-Type R launched for the 2015 model year upped those figures to 550/502 with a sub 4.0-second zero to 60 time. Who could want more? Apparently someone, because for 2017, Jaguar launched the F-Type SVR with a supercharged V8 jacking up horsepower and torque figures to 575/516, respectively, with a zero-to-60 mph time of 3.5 seconds. But the tenths of a second shaved off the zero-to-60 time came with an MSRP of 128,800, nearly double that of the base F-Type. Total cost of the 2017 SVR I drove last spring was $132,283 with extras and destination and delivery included. 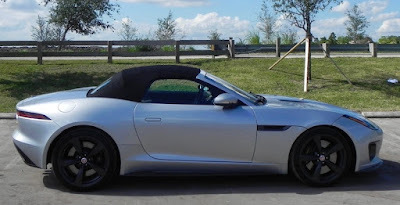 For 2018, a new 4-cylinder F-Type joins the lineup as well as a 400 Sport model that I recently had the opportunity — and pleasure — to drive for a week. A limited production model that will be on sale only for the 2018 model year, the F-Type 400 Sport has all the features of the base model plus distinct design features like special 400 badging at the front and rear, full leather seats and panels, a heated steering wheel and other distinctive cosmetic touches that intensify the roadster’s sportiness. Under the hood is a 3.0-liter supercharged V6 that is rated at 400 horsepower and 339 pound-feet of torque. Those numbers are not up to the supercharged V8s in the R or SVR, but unless you really want to shave a second from your zero-to-60 or your name is Lewis Hamilton, you’ll probably going to be satisfied with the 400’s performance over the more expensive SVR and may not even notice the difference. 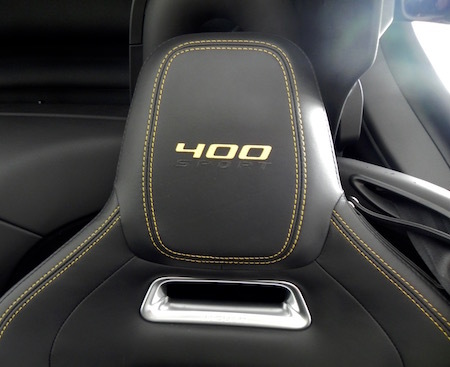 The only transmission offered on the 400 is an 8-speed Quickshift automatic with paddle shifters. (Sorry, stick fans. If you want a manual, you’ll have to go with a lesser-powered models. Not that that is a bad thing.) You can flick the switch on the center console to dynamic mode for even quicker throttle response and a firmer ride, plus get extra pops from the dual exhaust. Did I mention fuel mileage? No, I didn’t. The government says you should get around 19 miles-per-gallon around town, 27 on the highway, and 22 combined, which isn’t bad considering the fun you get behind the wheel and the looks of envy from bystanders and parking valets. The government says you’ll pay about an extra $2,750 in fuel costs over a 5-year period. Speaking of cost, the Monroney sticker that came with my test 400 Sport had the base MSRP at $0.00 with options like a climate package, premium sound system, and wind deflector adding $0.00 for a total of $0.00 with destination and delivery added in. I put my bid in for two at that cost — one for me, one for my wife — but I’m still waiting. Later, a company spokesperson reported the MSRP for the F-Type 400 Sport actually is $93,595, including destination and delivery charges. Options like a Climate Package (dual-zone A/C, heated windshield, and heated and cooled seats), suede visors, a Meridien premium sound system, and blind spot monitor can get the total to nearly $97,000. But keep in mind that things like a premium leather interior, LED headlamps an taillights, keyless entry with push-button start/stop, Bluetooth, rear parking aid, premium sound system, an 8-inch touchscreen system with Navigation Pro are all standard. A roll-over protection system is among safety features. The MSRP range for the 2018 F-Type is $59,900 to $125,000. What I liked about the 2018 Jaguar F-Type 400 Sport convertible: The performance is breathtaking, even when you aren’t where you are able to push it. Once you’re in it, the ride is comfortable as well (but not especially quiet). Raising and lowering the top is a one-button operation, and it comes with an electronic parking brake. 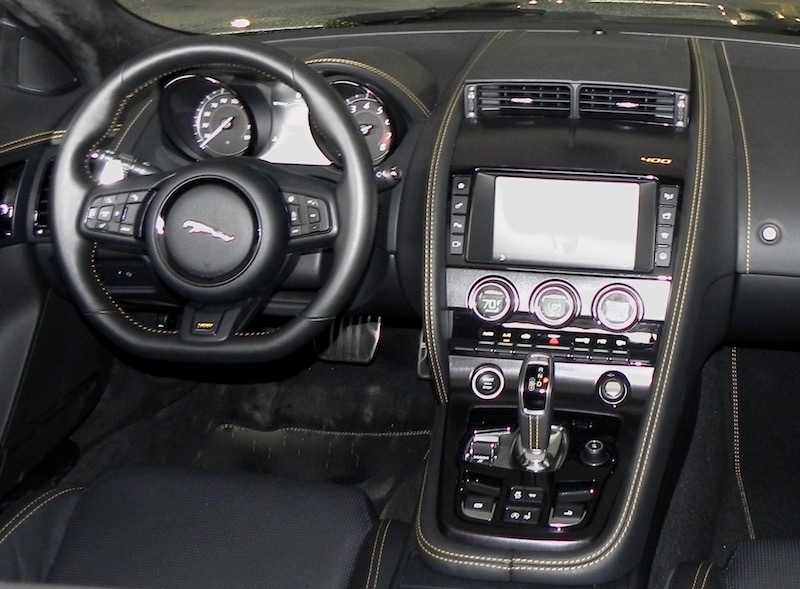 What I didn’t like about the 2018 Jaguar F-Type 400 Sport Convertible: The infotainment system is on the fussy side. 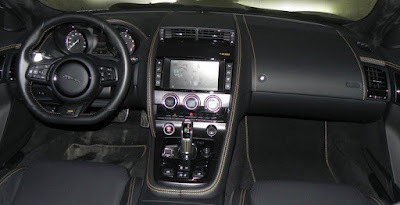 Why have a knob to turn the radio on/off and adjust the sound level (also available on a control on the steering wheel) and not have one to surf the dial? 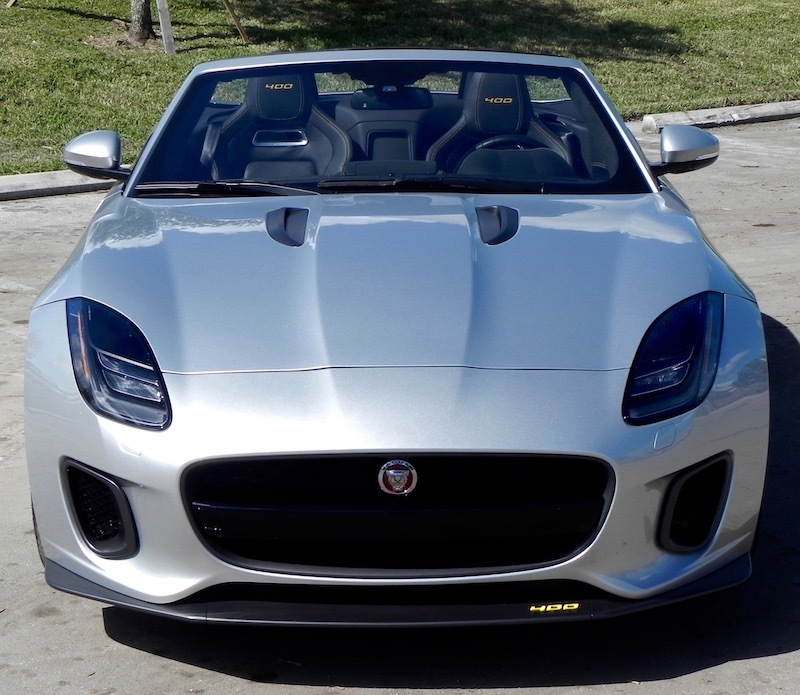 Would I buy the 2018 Jaguar F-Type 400 Sport Convertible? If it were only in my budget, I’d do it in a heartbeat. But, as with most (if not all) convertibles, this is not for family transportation and may represent the ultimate in automotive indulgence. But, hey! You only live once.